Conveniently located inside one of Budapest's largest shopping centres and leisure destinations this business centre is surrounded by a diverse set of companies in the local area, offers both private and virtual office solutions, private meeting rooms, business lounges and panoramic views over the city skyline. The centre is also easily accessible by tram, car and walking, making commutes as simple as possible from any point of the city. Originally serving as the residence of the Hungarian Prime Minister and built in 1890 and now refurbished with modern office design this centre is ideal for anyone looking for a unique and prestigious location for their business. Secure underground parking available. Transport links in the area are also very good, with Bajza utca underground rail station directly adjacent to the building and Budapest-Keleti Railway Terminal within walking distance from the site. On Deák Ferenc square, right in the city centre of Budapest this flexible office space boasts a central location while being situated on a quiet pedestrianised street (yet only 50m from parking). Included is a meeting / convention area suitable for up to 50 people. Parking spaces are available mere meters from the centre itself, making the building easily accessible and very well suited to both local residents as well as commuters. Strategically located on the Buda side of the River Danube, in the heart of Budapest, close to the city centre and to the Margaret Island and surrounded by luxurious hotels, shops, restaurants, cafés and a massive fitness facility, this centre is excellently served by tram, railway, underground and buses and it is therefore easily accessible. It is provided with 24/7 security service and large parking facilities. You business can benefit from this centre's full range of services, and it is suitable for companies of any background. Completely refurbished in 2007 and renovated in 2016, this classical office building is within the immediate vicinity of the famous Szent István Basilica and provides cost-efficient serviced office space for up to 120 people. The offices feature professionally furnished interiors and benefit from an abundance of natural light; providing ideal working conditions throughout communal spaces. Strategically located on the border of the 8th and 9th district of Budapest this business centre was opened in November 2016 and provides space for up to 100 workstations. The space provides suites that offer a great deal of flexibility in terms of both office layouts and occupancy terms for corporate clients. The light and airy space has great access to local transport services, keeping you well connected to the rest of the city at all times. Located in Budaors, business area close to Budapest and easily accessible by motorways and by public transport, this building enjoys an outstanding view of the Hungarian city and of the Buda Mountains. The centre offers offices equipped with the latest technology and provided with a full range of services and facilities: telephone facilities, fast internet connection and Wi-Fi, IT rooms, secure parking facilities, catering and reception services. These working spaces are available at an excellent price. An impressive centre situated in a professional area of south Budapest. The offices are furnished and available on flexible terms at affordable prices. Offices benefit from 24-hour accessibility, high-speed internet, reception area, spacious meeting rooms and a beautiful exterior terrace. The surrounding area is easily accessible through public transport links, with numerous bus, rail and road connections available in the immediate vicinity. The local area is also filled with trendy bars, supermarkets, restaurants, hotels and schools. A massive working space is available in the main IT and Telecoms district of Budapest, which hosts the headquarters of many leading companies. This business centre, recently built, offers large green spaces, an ideal working environment and is equipped with high standard services and state-of-the-art technology. The secretarial team at this wonderful centre will greet clients and handle your telephone answering so that your business can run efficiently. The offices are served with excellent transport connections. Wondefully located in the centre of Budapest, close to the main sites of the city, surrounded by several restaurants and cafés, this building is just a few minutes’ away from various public transport routes. Recently refurbished to a high standard, this building offers large offices, provided with advanced technology and various facilities. The working spaces are available on flexible rental terms. High standard office spaces and meeting rooms are available for full-time and part-time renting solutions in this building centrally located, close to Moszkva Square and surrounded by important banks, well-known restaurants, luxurious hotels and shopping centres. These working spaces are provided with professional reception services, secure parking facilities and on-site restaurant. This centre is excellently served by public transport and well connected to the Ferihegy Airport. This impressive building is located in the centre of Budapest, close to the most important sites in the city, surrounded by a wide range of amenities. It is set in a key location, within easy reach of the Ferihegy Airport and motorway junctions. The building offers a selection of offices provided with lounge area, cybercafé and 24/7 CCTV monitoring. There are videoconferencing facilities in addition to well designed meeting rooms. These lively and stylish serviced offices provide a range of traditional offices and social spaces to suit your needs. Located in the heart of Budapest, and easily accessible, this center is surrounded by a superb range of shops and restaurants. The site is accessible 24/7, with 24-hour security. This lease opportunity offers use of a meeting room for a few hours or an office for a short period of time. Found right in the city centre of Budapest, this business centre offers a selection of premium office spaces varying from private offices to coworking desks and meeting spaces. You will also have access to event spaces and workshop rooms. Work stations benefit from high speed internet, printing facilities and daily cleaning services. The area offers a vast selection of eateries and great access to public transport links. This building is located in the centre of Budapest, and is easy to reach by public transport. This is a contemporary building offering a range of office spaces to suit your needs. A city agency that aims to stimulate the sector and encourage entrepreneurialism is just 5 minutes from the centre. The building is highly convenient for business travelers and commuters. The upper two floors offer great views over the city. 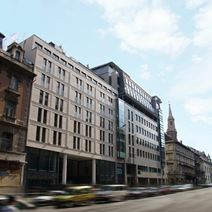 This office is situated in the heart of the 3rd district of Budapest. Modern category 'A' office building that has all the necessary services with quality standards. One side of the office looks at an ancient roman amphitheatre the other side looks at a quite inner patio. Close to restaurants, cafes, shops and more, this modern Class A office space provides a selection of workspace solutions to meet your specific needs. Your business can surely benefit from the area's high footfall. Located in the historical area of Óbuda, the surrounding area has plenty to offer, making this a desirable location for any business. The centre offers proficient office solutions, which includes meeting/conference facilities for up to 20 people, full furnished and beautifully decorated offices and meeting rooms with projectors and smart TVs. You will also benefit from printing/copying facilities, fully equipped kitchens for your convenience and a lounge/reception area to impress your guests. Located at Duna Tower, at a prominent address in Budapest, and close to banks, restaurants, gyms, as well as stunning views of the Danube. A multilingual staff ensures the smooth running of your business on a daily basis, providing secretarial and administrative services such as telephone answering, mail handling, translations, printing, binding etc. The business centre has three fully equipped meeting rooms which are also available for clients. This impressive business centre is located in the most dynamic and important business district of Budapest, easily accessible by public transport and motorways. The building consists of modern offices equipped with advanced telecommunication technology, fast internet connection, air conditioning, parking facilities, and shared reception. This working space is provided with first class receptionist and administrative staff who offer answering and transferring calls services, translating documents, bookings, catering services for conferences and meetings, and all the services your business might require. This centre provides a green, healthy, happy co-working office space in the center of Budapest to entrepreneurs, non-profits, and value-driven communities of people who innovate, create, and do good. At this centre, you get a complete professional office environment, at low cost, and space solutions tailored to your needs. This centre takes care of maintaining your office space, furnishing it, and providing a suite of free or low cost services allowing you to focus on your core business. The space is located right in the heart of Budapest. Here you can make use of the on-site meeting rooms, meaning if you meet with clients often you know you have a professional and confidential environment within the building. The nearest underground station being Opera is a short three-minute walk away from the space and the mainline train station is located a thirty-minute walk away from the office space. Set in an old factory and recently refurbished, these massive office spaces are available on flexible rental solutions to respond to clients' requirements. The offices are equipped with advanced technology, wireless internet connection and a full range of services and facilities to run your business. The building is located in one of the most dynamic areas of Budapest, which hosts leading companies and landmark buildings together with restaurants, cafés, gyms and tennis courts. It has easy access to underground, tram and bus lines. Located at the Terrapark Business Park this center was opened in December 2015 and provides private office space suitable for one to 12 people. At this centre, your company can take advantage of a reception area, administrative support, a spacious meeting room, equipped kitchens, a private and secure garage and significant storage facilities available. The office building provides easy access to various local services and amenities. This is the perfect space for whether you are a start-up or a larger enterprise; the centre can also provide you with settlement and legal support, accounting, and cleaning/maintenance service will keep your work area looking professional and tidy. The business centre has the WestEnd shopping centre down the street, as well as the Hilton Budapest, where your guests and clients can stay. The airport can also be reached in less than an hour by public transport and by car. Working spaces are available in a modern building which offers a wide range of facilities, including a lounge area, a cybercafé, a sandwich bar and secure parking facilities. Moreover, this space also offers administrative/IT support so that your operations can run smoothly. The building is located in the city centre, well connected to the motorway and to Ferihegy Airport. It is also served by underground lines and other public transport. A great, modern centre situated in a thriving business district spreading across seven-floors in an impressive building. All work-spaces benefit from plenty of natural light, high-speed internet and spacious meeting rooms. A stunning interior garden is also featured on-site which provides lovely scenery. The surrounding areas are filled with local restaurants, supermarkets and other useful services. Transport links are substantial as well, with many bus and train connections circulating the area. An exceptional opportunity to rent office spaces within the most renowned business area in the all country. This building offers lounge area, on-site café and secure parking facilities and it is close to gym, fitness centres, shops and numerous amenities.There are also reception services, which will establish a prestigious presence upon entry. It is centrally located in Budapest, within easy reach of the most famous attractions in the city. Within walking distance, there is a great selection of hotels at which to accommodate visiting executives. 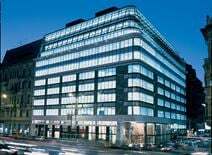 Set against the beautifully restored historic backdrop of Széchenyi Square and the River Danube this premium A+ category office building in Budapest provides a range of fully furnished office space along with conference facilities suitable for up to 60 people. There is ample public parking available in front of the building at Széchenyi Square, as well as, 24/7 guarded parking underneath the building. The business centre is located 3 km from the Nyugati (WestEnd) Railway Station, 5 km from the main motorway junctions (M0, M1, M3, M7) and 20 km from Budapest Liszt Ferenc International Airport. Situated in the main junction of Budapest, surrounded by the most important amenities of the area, this office space enjoys a strategic location with excellent transport links to the city centre and to motorway junctions. This favourable location grants the visibility and accessibility that any successful business requires. 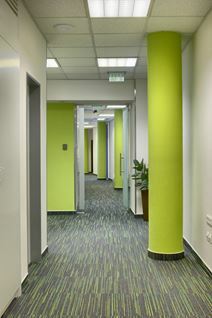 The building offers offices of modern design equipped with advanced telecommunication technology, fast internet connection, air conditioning, parking facilities and shared reception. This working space is provided with first class receptionist and administrative staff who provides answering and transferring calls services, translating documents, bookings, catering services for conferences and meetings, and all the services your business needs. With a prestigious central Budapest location, this professional business centre provides flexible term furnished offices with quick and easy access to the hustle and bustle of the city. You will also be close to one of Europe's shopping malls and surrounded by restaurants, retail outlets and cafes. You can also benefit from 24-hour access and security, allowing you to operate with peace of mind no matter what time of day. Modern furnished offices with high-speed internet, with the flexible option of one single payment. Perfect for short term projects with the option to cancel within a month's notice. Windowed offices, interior offices, coworking spaces and suites are available, with a friendly reception team to handle administration services. The centre is located in a prime, sought-after spot in Budapest, with an abundance of transportation links within its locality in addition to local amenities to enjoy.